Pierre Gider holds a Ph.D. in sports science from the University of Graz (Austria), an M.A. 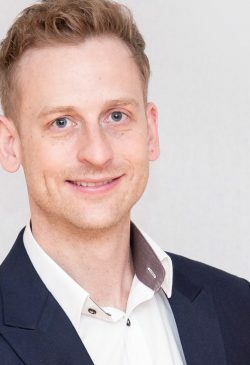 in philosophy, and a certificate in social competency from the Austrian Institute of Social Competence.i Currently, he is a program director and lecturer at the University of Graz in sports biology and specific kinetics in dancing. Pierre also serves as the technical delegate for dancing with the Special Olympics International, which held its first competition in 2015. In addition to his academic career, Pierre is a seven times Austrian champion in different styles and categories of ballroom dancing. He has worked in Europe and USA as a dance instructor, educator and life coach. While developing health-oriented dance programs while residing in Florida, he developed The Gider Method designed to improve physical, mental and social wellbeing, and founded Gider Dance Consultants International LLC. Pierre also owns a dance studio in Austria, which offers special classes to promote healing and social wellbeing for children with special needs, pregnant women, “kids and parents,” people living with dementia, and their families. Recognizing the numerous benefits of dance to people’s personal lives and family relationships, he is delighted to offer his support with the development of Family Spirals™ dance programs. Pierre and his family – his wife, son, daughter and two dogs – live in a small town near Graz, Austria. You can follow him on Facebook or connect on LinkedIn (please introduce yourself through your request). i To learn more about the discipline of social competence, click here.